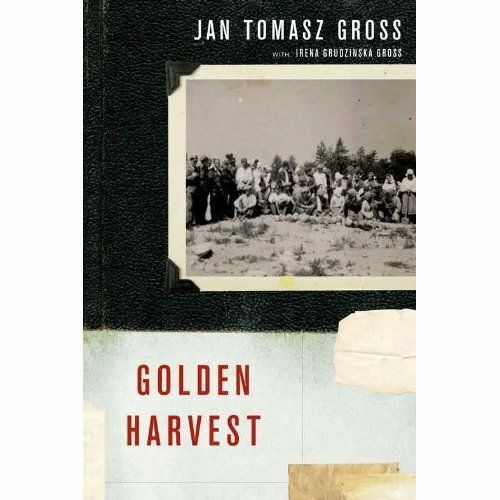 Golden Harvest was written as a historical essay, it gives an account of peasants who pillaged the mass graves of Jews buried at the sites of historical pogroms, such as Treblinka. The book was inspired by a photograph of a group of men standing before a great pile of human bones. According to Gross, "we see a bunch of peasants standing atop a mount of ashes. These are the human ashes of 800,000 Jews gassed and cremated in the Treblinka extermination camp between July 1942 and October 1943". The claim is that the men were digging through the remains in order to find any valuables that the Nazi executioners may have overlooked. The book alleges that many Poles profited from robbing the graves of massacred Jews in the decades following the war. Jan Tomasz Gross and Irena Grudzińska-Gross are Professors and academic writers based in the United States, whose writings on overlooked aspects of Slavic-Jewish relations during World War II and after the war have incited a great deal of controversy throughout the world, especially among Polish Americans. Jan Gross is a Professor of History at Princeton University and Irena Grudzinska-Gross is an Associate Research Scholar in the Department of Slavic Languages and Literatures at the same institution. An email campaign against the publication of the book was launched by Anna and Andrzej Kołakowski in early January, based on the "defamatory" aspects of the book with regard to the Polish population. Polish writer Andrzej Stasiuk commented on the controversy soon after its publication, saying "The Germans got rid of the ashes, thereby ridding themselves of the guilt and cleansing themselves. We had lived with the Jews for centuries and now we live with their ashes, with their spirits, and this is how it will be until the end of the world. It is quite possible that we will never come to terms with it." The conference in Warsaw on the 8th of February 2011 was held solely for journalists, with the details of the location withheld - presumably for security reasons following a great deal of protest against early previews of the book. Participants in the conference were presented with a final copy of the book. Znak's President Henryk Woźniakowski and the book's editor and the Editor-in-Chief of the Znak monthly magazine, which will be in large measure devoted to Gross' novel.The book officially comes out in bookshops across Poland on March 10, 2011. The English edition of the book, originally scheduled for August 2011, finally came out in March 2012, published by Oxford University Press.